A report on Wednesday claims Apple has pushed back plans to start mass production of a 12.9-inch iPad model due to poor display yields, and will move forward with a revised ramp up cycle set to start in September. According to Bloomberg, sources claim Apple originally planned to kick off production in the first quarter of 2015, but supplies of the larger 12.9-inch panels have forced a delay to September. Assuming the rumored assembly timeline, Apple could be looking at a fourth quarter or early 2016 debut. 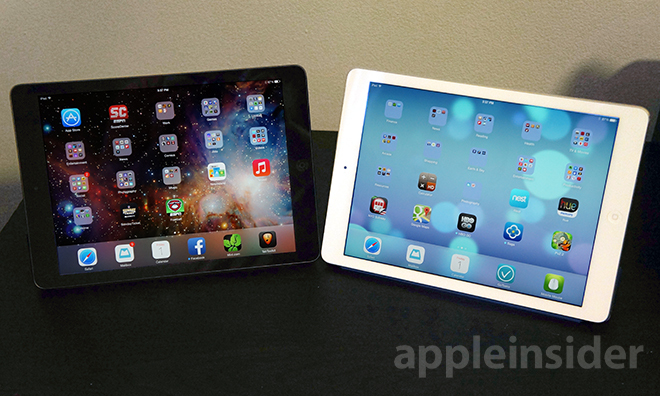 Late last year, pundits expected the so-called "iPad Pro" to hit store shelves in the first quarter of 2015. Those guesses were refuted in November by noted analyst Ming-Chi Kuo, who said Apple's larger-screened tablet is unlikely to enter mass production until the second quarter of 2015 at the earliest. At the time, Kuo cited a crunch on component production and assembly as catalysts for delay. Aside from a supposed rendering and a questionable photo of an alleged production mold, information on Apple's as-yet-unannounced jumbo iPad is scarce. Rumors suggest that Apple will use the extra chassis space afforded by a larger display to build in extra speakers that provide stereo output while viewing content in the landscape orientation. More recently, Kuo speculated that Apple could launch a branded stylus to be sold alongside iPad Pro, while a follow-up model might sport advanced 3D writing capabilities. Today's news lines up with statements made by Apple CEO Tim Cook, who in January intimated that the iPad lineup may not see significant changes during the first half of 2015. During the company's most recent quarterly investor conference call, Cook was upbeat on the future of iPad, noting his position offers a clear view of Apple's product pipeline. The Apple chief was careful not to send mixed signals, however, saying, "I'm not projecting. To be clear with everyone, I'm not projecting something very different next quarter or the next. I'm thinking over the long run."